Rev. Dr. E. Gail Anderson Holness introduces her daughter and fellow minister, Ali. Seated behind her daughter on the altar, the Rev. Dr. E. Gail Anderson Holness nods in agreement as she looks on with pride, her hands folded in her lap over a purple robe. It’s Youth Sunday at Christ Our Redeemer African Methodist Episcopal Church, a tiny church tucked between buildings on the busy Upshur Street in the Petworth neighborhood of Northwest D.C. Holness’ daughter, Ali, is in town for the AME Annual Washington Conference, where she will finally be ordained as a pastor, and she stopped by her mother’s church to give a sermon. The annual conference has served as a family reunion of sorts. Despite the cold, rainy weather in Washington that Sunday, the elder Holness and her relatives have a way of warming the entire church with their infectious spirit. 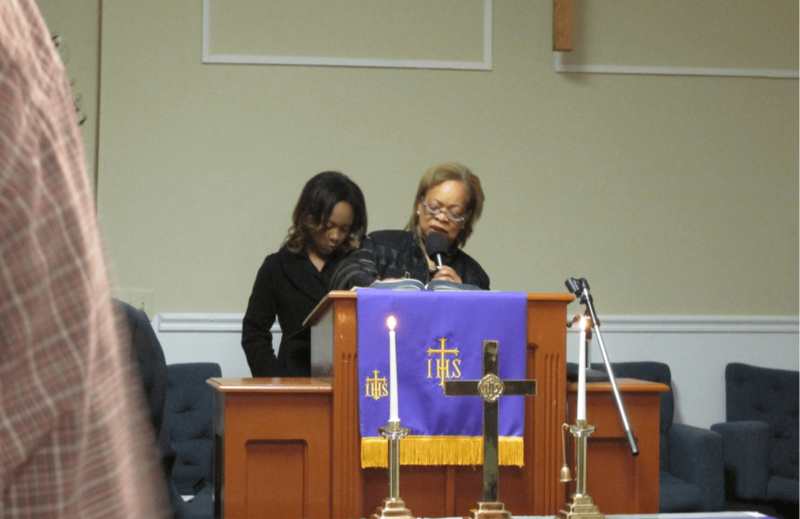 The mother-daughter pastor team that Holness and her daughter have formed is a rare case, even for a church that accepts women in the ministry. In the AME church, the region’s bishop appoints pastors to a church every year at the annual conference. Holness believes that men are easily favored for bigger and better churches, as well as elevations in the church hierarchy. Out of the 20 districts around the world, only one has a female bishop, according to the AME Council of Bishops. You have to have a positive spirit to have the storied life Holness has led. Born and raised in Columbia, S.C., Holness was the youngest of 10 children in her family, all of whom, she says, went to college. Holness moved to Washington, D.C., in 1978 to attend Howard University School of Law after graduating from Clark University in Atlanta. She graduated from law school in 1981 and immediately went to work on one of the most notorious cases in American history: the Atlanta child murders. Rev. Dr. E. Gail Anderson Holness doubles as an Advisory Neighborhood Commissioner in Washington. As she sits in her office at Christ Our Redeemer, where she’s served as pastor for five years, Holness seems very comfortable. She regularly greets her parishioners with familiarity and hugs them after service as they leave, having genuine conversations with them about their lives. However, she hasn’t always been part of the AME faith. “I’m quite ecumenical,” says Holness with a laugh, referring to her various stints in different Christian religions. She grew up in the Baptist church — though her father’s side of the family was AME — and chose to be Catholic as an adult before switching over to the AME church. She began pastoring in the AME church in 2000 – first in her hometown of Columbia, S.C., and then in Washington. Holness switched from being a full-time lawyer to a full-time pastor. Another reason for her move back to D.C. in 2003 was racism in her old hometown. “They are real racist; they kind of ran me out of there,” Holness admits. After being instrumental in getting her hometown to remove the Confederate flag from the Capitol building, she began receiving threats. “They threw [Molotov] cocktails through my church window and threatened to kill me and my daughter,” says Holness of some of the town’s residents. Though after so many years away from the situation, she is able to take it in stride. “They did not like this colored girl, but I never considered suicide because the rainbow was always enough for me,” she says evoking the title of Ntozake Shange’s acclaimed Broadway play. It turns out that Holness has always been a political person. When she was younger, she wanted to be a lawyer and politician. She already made her lawyer dreams come true at a young age, and now she serves as a commissioner on the Advisory Neighborhood Commission for Ward 1B. According to the international organization Women in Ministry, dedicated to women in the AME church, more than 3,350 women are in the ministry worldwide. Still, those within the church agree that women pastors are the minority. “Men are nurtured in ministry,” Ali Holness says. “Women comprise the majority of the population, but not even 50 percent of the leadership.” The AME church – like many other denomination’s churches – is a male-dominated place. Despite all her achievements in life – including a Doctorate of Ministry from the Howard University School of Divinity – Holness still hasn’t been elevated within the church for five years. She was reappointed to Christ Our Redeemer at the annual conference in April. Although Holness loves her tiny urban church and its community, she is hopeful for an elevation at some point. “I’ll just pray on it,” she says with a cheeky grin.